A California Gull was rescued wrapped in fishing line. The blackened foot has died because the blood flow was cut off. Fishing line pollution is an entirely preventable hazard. Water birds, songbirds and birds of prey, as well as some wild mammals, are vulnerable to entanglement in fishing line and hooks left in streams, on banks or hanging from bushes and trees. Pets, especially dogs, and people, can also run afoul of fishing line pollution. If you are the person fishing, take responsibility for removing tangled line and hooks before you leave your fishing spot. In most instances, it won’t take much time or effort. At the worst, you may have to wade into a cool stream or pond to retrieve the broken line. If you are simply visiting the stream or pond and spot discarded line and hooks, be kind and take a little time to remove some of the offending hooks and line. Be sure to discard the fishing line and hooks securely and safely. If this material is left in an open trash can or dumpster, wildlife is still at risk of entanglement. If you find a wild bird or mammal tangled in fishing line, cut it free from the line, place in a snug, padded container, and call Wildcare Eastern Sierra. The animal may have sustained injuries from line or hook and could be dehydrated or starving as well. A Golden Eagle flew into this truck windshield. You can take precautions to help prevent window strikes. Birds of all kinds fly into windows, glass doors and skylights, resulting in many of the bird injuries we treat. Sometimes a bird sees her reflection in the window and thinks it is an intruder and tries to chase it away. A bird is frightened or chased by a hunting hawk; in his panic, he flies straight into the window. Many cat-caught birds hit windows first. You can shine a light from inside the house onto the window the birds fly into and wash out the reflection. Pulling drapes or lowering blinds can help some, but there may still be a reflection. Static cling decals will not keep a bird flying from a hawk safe, but will help in other ways. You can purchase special decals such as Window Alert (http://windowalert.com) or others from stores like Wild Bird Centers. Hawk silhouettes can be produced inexpensively and simply taped to the problem window. The shape of this predator alerts the flying birds and they will steer away from it. Download one HERE to print out. Used DVDs or computer disks hung on the outside of your window are a great way to help birds spot the danger. Colored ribbons or reflective tape (often sold to keep birds off of fruit trees) can also be hung in front of problem windows. Bird flash tape – Amazon has several varieties; some nurseries carry it. If a bird does hit your window, pick it up immediately, put it in a snug, padded container, place the container in a warm, dark place (a heating pad on low under half of the box is recommended), and call Wildcare Eastern Sierra. This young coyote was found with a leg injury on the side of the road and brought to our rehab, where he was treated and released. Vehicles are the greatest single cause of injuries to wildlife. More than a million wild animals are killed on roads and highways every day of the year. Many more are injured. We’re not going to give up our cars and trucks but we can do some things to help prevent birds and mammals from being hit by them. A high percentage of wildlife hit by vehicles are feeding on roadkill. You can help by removing roadkill from traffic lanes and shoulders. Be sure that you are safe while doing so. Certain places attract wildlife. Notice those places on your regular driving routes where streams cross under the highway or where you have seen raptors perching or deer grazing. Pay attention, especially near dusk and dawn.Deer crossing signs mean just that. They are placed where it is known that the animals often cross the road. Activity will increase during spring or fall when the deer are moving up or down slope. Near dusk and dawn are the most critical time for deer and elk. 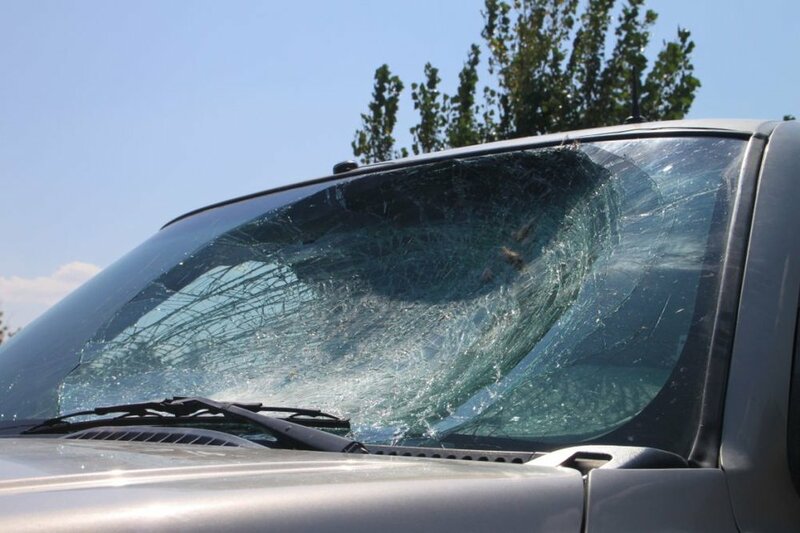 Be alert: hitting a deer can be dangerous for you as well as the deer. Many thousands of wild animals hit by cars are brought to wildlife rehab centers each year. Many of them can be helped. If you spot an injured bird or mammal, or if you hit one, cover with a towel or sweatshirt and place in a box or similar container. Handle gently; be careful of your eyes and watch out for talons. Wear gloves if you have them. Keep the animal warm, dark and quiet and call us. This wren was caught in a glue trap. Glue traps are inhumane and unnecessary. Also known as “glue boards," sticky glue traps are made of pieces of plastic or cardboard coated with a strong adhesive designed to trap any animal who wanders across or lands on the surface. Glue traps are both inhumane and indiscriminate, frequently trapping and killing songbirds, lizards, bats, kittens and other small mammals. Trapped animals suffer a cruel prolonged death of dehydration, starvation and suffocation over the course of several days. In an attempt to free themselves, animals may chew off limbs, their bodies become stuck in contorted positions that result in extreme pain, and at times they can be heard screaming. At Wildcare, we witness firsthand the horrible suffering of animals caught by glue traps, and we implore you to never use them. Trapped animals suffer a cruel prolonged death of dehydration, starvation and suffocation over the course of several days. Less rainfall means less food, leading to a host of secondary perils for wildlife. Scant vegetation and a poor supply of insects results in fewer small birds and mammals (prey) and that means less food for predators. Many of the baby season’s youngsters will fail to thrive because parents cannot find enough food for themselves and their young. Birds and mammals are forced to leave known territories in search of food and water. Dispersal brings them into conflict with resident wildlife and other wildlife on the move. Traveling in unknown territory also increases the likelihood of being hit by vehicles or caught by cats and dogs. Weak, starving animals fall prey to internal and external parasites. When rodents move into human-occupied habitats in search of food, the use of rat poison increases. Rodenticide use frequently results in the poisoning of non-target animals such as eagles and owls, cats and dogs. Please call Wildcare Eastern Sierra to discuss options other than poison. Cats are natural predators. Dogs love to chase. We all know that wild birds and cats don’t mix very well. Although cats would prefer to chase mice, there aren’t as many mice around our homes as there are birds. Thousands of birds are caught by cats every year (some birds are caught by dogs, too). If you have a bird feeder: hang it in an area where the ground beneath and nearby is open with no places for cats to hide; keep it close enough to trees or bushes so birds can hide when a hunting hawk dives on them; sweep up fallen seed from the area beneath the feeder to keep birds from feeding on the ground where they are most vulnerable; removing fallen seed (along with keeping feeders washed and clean) will help prevent transmission of any possible disease. Bells on cats don’t help much, but they do help some. The bigger and louder the better. If you are aware of birds nesting in your yard, try keeping your cats in for a few days when the babies are fledging (leaving the nest). It takes baby birds a day or two to get their flying skills up to par. Dogs can be trained to “leave wildlife alone.” Contact Angie Tapley in the Inyo-Mono area for information on classes at (760) 937-5772. Many cat-caught (and dog-caught) birds can be helped. Keep them warm, dark and quiet and immediately call Wildcare Eastern Sierra for help. The lead can only be eliminated by the administration of a chelating agent that will bind with the lead and pull it out of the body in the waste. Most commonly used in wildlife care is injectable calcium and B-complex vitamins. Wildlife may ingest lead by eating prey that contains lead in the form of lead ammunition. Eagles, turkey vultures, and great-horned owls will eat carcasses. It is also well known that the California Condor eats carcasses and can ingest lead in the process. Lead ammunition can also be found in “gut piles.” Hunters often gut and partially butcher animals after shooting. Lead shot often fragments, sometimes into nearly microscopic ones, distributing it widely through the body. Seabirds often ingest lead sinkers and jigs and become ill. Raptors and other predators may feed on these poisoned seabirds. Fish-eating birds, such as bald eagles and osprey, may ingest lead directly from fish that contain lead sinkers or lures. Waterfowl, especially "dabblers" that feed at the bottom of ponds, lakes and streams, can ingest lead pellets that may have fallen to the bottom. This can cause lead poisoning in the waterfowl and, secondarily, into those who prey on them such as bald eagles, turkey vultures, and other scavengers or predators. Environmental contaminants such as lead batteries, lead paint, lead smelters and mining, and sewer sludge can also be sources of poisoning. We are in touch with biologists at U.S. Fish and Wildlife for more information about possible ingestion of lead through ground and/or water contamination. There have been some cases (not local) of raptors diagnosed with lead poisoning who frequented areas where lead mines operate or once operated. The questions we want answered: Can lead in the environment get into the body through drinking water? Can it get into vegetation and from there into prey species such as rabbits and ground squirrels? Do we have sites in Inyo and Mono county where there is known lead contamination: Example: the old auto salvage yard in Benton; illegal dumping sites found out in the desert.